The readings today are rich and familiar. In our Gospel story of the feeding the 5,000, there is one person whose vision and faith go virtually unsung by Saint John. As the disciples are worrying about Jesus' question -- "Where are we to buy bread for these people?" -- one small solution steps forward. 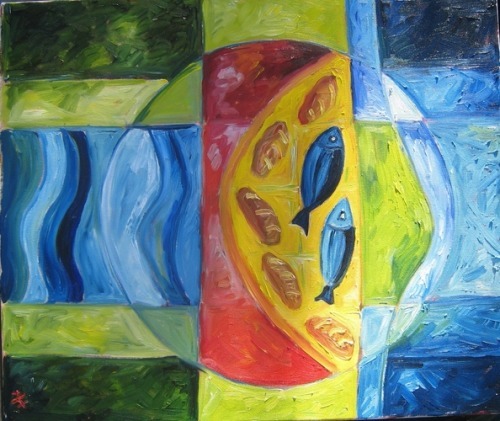 A small child offers as an answer to the food question a new possibility -- five barley loaves and two fish. With childlike trust, the lad offers all that he has to Jesus and the disciples. Andrew has enough presence of mind (and perhaps a small flicker of hope) to offer these childish gifts to Jesus. But his hard-nosed adult rationality gets in the way, for even as Andrew offers the loaves and fish with one hand, he pulls them back with a defeatist, "What are they among so many?" dismissal. Jesus likes the child's solution. He uses the little boy's gift to feed the people. This child's heartfelt gift indicates that his vision and hope were not limited by the accepted norms of the day. He saw possibility, not puniness, in those five loaves and two fish. The child taught the disciples a lesson: They should have been looking for ways to succeed, not looking for excuses to fail.